Today Ola and Hosam were scheduled for their renewal session in the police academy courthouse within the Torah prison complex. Unfortunately Ola showed up for the initial session but Hosam was not present. 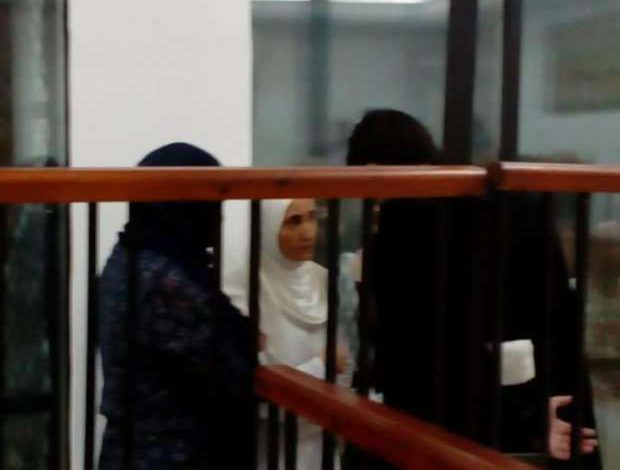 After Ola’s session was completed and she was removed from the court, Hosam was brought into the court cell. During Ola’s session her lawyers requested that she be released. The judge requested that she be brought before him outside of the court cell. She was allowed to speak and informed the judge of her medical conditions. She reaffirmed that she was innocent and that she has no idea of why she is detained. She also informed that the judge that she has not had a visit since her detention. The judge approved a single visit for family members present in the court and her lawyer. Both were allowed to enter the court cell and speak with her. It was an emotional scene in the court. The judge extended Ola for another 45 days without any explanation. Hosam’s renewal was postponed to September 22 2018. Since Ola announced her hunger strike on June 26, 2018 no one has had any communication with her. Today she informed her family that after some time prison authorities pressured her to stop. In return the authorities stopped the physical abuse but her demands for a release, medical care, and an end to solitary confinement have been ignored. As of today, Ola has been held in solitary confinement for 445 days. Ola’s daughter Aayah Khalaf, has been advocating and reaching out to human rights and social activists across the United States and the world calling for solidarity and support. Social media awareness and engagement has grown over the last several months and Ola’s case has become an internationally recognised human rights ordeal. On September 25, 2018 the European Parliament will be hosting a hearing on the human rights conditions in Egypt and will be presenting Ola’s case as a highlight of the gross human rights violations by the current regime. Ola’s family is extremely concerned about Ola’s health and calls upon the Egyptian government to transfer her to a hospital and to unconditionally and immediately release Ola and Hosam.